Jay Z’s Supposedly “Mistress” disses Jay & Beyonce…. In a song? Well it’s been rumored that the billionaire “it” couple has had trouble in paradise because of none other… cheating. Well recently Life&Style magazine released an issue of their magazine. 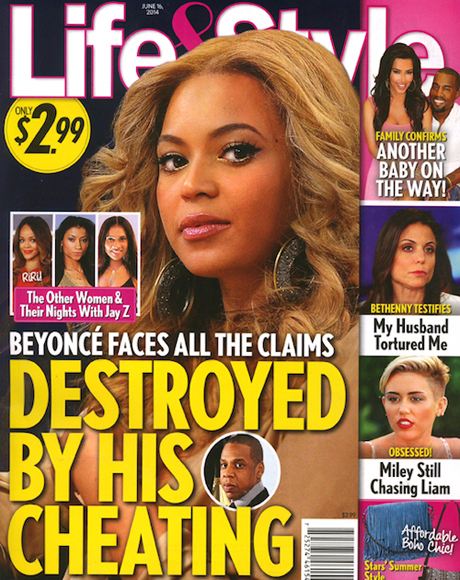 With the front cover being a very unflattering picture of Beyonce, with the headline in all caps ” BEYONCE FACES ALL THE CLAIMS DESTROYED BY HIS CHEATING”. In it his suppose mistresses are no surprise Rita Ora & Rihanna who have both denied such allegations. I’m still raising the brow at Rihanna because it’s kinda weird to me she’s been signed to jay and is his biggest artist and beyonce doesn’t have not one track with her but has one with drake. But this last mistress is a total surprise who goes by the name of LIV. A “rapper” and I had to quote that & after you listen to the track you’ll understand why. Who’s released a song called “Sorry Mrs. Carter” to the outcast “Sorry Ms Jackson” track claiming she isn’t just some side chick in fact “when she left jay she took a piece of his heart with her” because they connected on what she says ” a hiphop level”. She says she’s apologizing to Bey but yet she is still taking shots at her saying ” The man? He likes model chicks. He like all naturally flawless model chicks like me.” & “You out here tellin’ them how to surfboard. Come on, now. Surfboards. Monica Lewinsky. You a married woman” ” Tell them really how you became his wife”. She also states she never slept with jay ( how horrible the quality of the song and video was maybe she should’ve slobbered jay down) stating ” F*ck F***ing to the top, me and jay never screwed”. Then she comes at Jay z stating ” Jigga man, I don’t care if you rap, you got to R-E-S-P-E-C-T” ” You got a good girl, why she messing with a bad guy?” If you want to hear the record watch the video below. Tell me what you guys think in the comments below!